El baile del tigre caught my eye as books with cats on the covers always do. The cover shows a tiger dancing with a little girl. I once tried to “commission” my sister to paint a portrait of me sitting in a cat’s lap, the cat reading me a story. I suppose I always fancied interacting with animals that way, in a fantasy world. 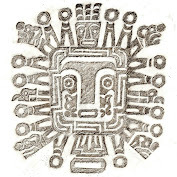 At any rate, I borrowed El baile del tigre from the school library and was enamored by the story and the drawings. This book now carries a special memory; I had the pleasure of hearing my own mother read it to my students. 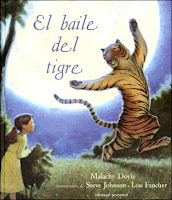 Originally published in English as The Dancing Tiger, Malachy Doyle creates a precious story of a little girl who discovers a tiger dancing in the forest in the moonlight. You can only see him when it’s quiet and the moon is full. One night, the little girl ventures out into the woods and surprises the tiger in mid-dance. He whispers to her not to tell anyone what she has seen. He promises that, if she keeps the secret, she can return to dance with him when the moon is full. And from then on, the little girl visits with the tiger once a month, season after season, to dance as only a little girl and a tiger can. The illustrations by Steve Johnson and Lou Fancher are truly special, in particular the scene where tiger and little girl waltz in the newly fallen snow, leaving their prints. This book is translated very well. The poetic text is perfect for teaching mood, setting, and descriptive language. One could even integrate the concept of seasons and phases of the moon. Personification also comes to mind, as we’ve recently discussed examples of this in my class. In the end, the narrator is revealed as an old woman who brings her granddaughter to the forest, to continue enjoying this wonderful fantasy. The woman sits and beholds the magic of the little girl and the dancing tiger in the moonlight. Last week, our school held a special day-long reading event, with invited guest readers. I seized the opportunity to bring my own parents to school to read to my students. I handed my mother this book to read to my fourth graders. She was wonderful, pausing to show the pictures, holding the book up for all to see. She read to my class as if she were reading to her own grandchildren. While she read to my students, I hoped that for a moment, they would remember their own grandmothers. I know that Mami and I both tucked the moment away in that place of special memories. Lovely message, Cassy. I'm glad our story meant so much to both you and your mother. Keep up the good work! Healthy Meals in 10 Minutes!